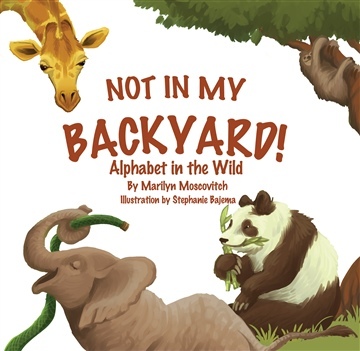 Not in my backyard is a gorgeously illustrated book that introduces the young reader to the alphabet through a mix of known and lesser known animals. Written in poetic form, the young reader will enjoy the rhyme and rythymn of the animals facts while learning their ABCs. Each illustration also contains hidden instances of the letter that starts the name of the animal they are reading about, allowing new discoveries to take place reading after reading. Pick up a copy today and watch your child's excitement grow as he or she learns about the Quagga or snuggles closer while searching for the letter 'A' in Aardvark. I started writing when my kids went to university. I thought back to when they were little and some of the challenges they faced. These challenges have not changed much over the years and I wanted to do something that might help kids handle some of these difficult situations. Some children are nervous and anxious when facing a new event or experience, and writing a helpful yet entertaining book was my solution. I published four books, two of which deal with specific subjects and two that are imaginative and fun. My biggest concern was, and still is, bullying. Bullying is a problem that remains current, and sadly it appears it always will. It is an issue I felt needed to be addressed at a young age, so I wrote a book about bullying that would be appropriate for kids from 2-7 years of age. Obviously my book isn’t going to solve all the problems, but it is important we start discussing this issue with kids at a younger age instead of waiting until it becomes a much larger and more dangerous problem. Reading “Booker and the Bully” to your kids also opens up a chance for discussion that otherwise might not take place. It explains what bullying is, gives options to try to stop it, empathizes with the child being bullied, identifies that the bully needs help as well, and ultimately encourages the child to tell someone what is happening. “Booker and the Bully” is on the Vancouver School Board’s resource reading list and in more than 100 elementary schools in the lower mainland. In my future there will hopefully be many more books published and more children helped and entertained! Although preparing kids for upcoming situations was what got me started, I enjoy writing whimsical, playful, and adventurous stories as well. My husband and I plan to do some traveling so perhaps our experiences will find their way into some of my stories.